Some people might not realize how much support and cushioning would be beneficial for their toddler’s feet. Just because they are young doesn’t meant they don’t need support or comfort in a great shoe. Under Armour has stepped up to provide quality shoes for your toddler that keeps them comfortable while they play and run. Most of the shoes are available in multiple styles, colors, and sizes. Under Armour Toddler shoes for boys (the Split, Assert, and Nitric) all come with many of Under Armour’s unique shoe features. The Split model contains many of the features found in the adult sized Split model, only in miniature form. High quality rubber is used on the soles to keep your little one from slipping and sliding while they learn to master the art of running. Flexibility and breathability are also characteristics of the Split shoe for your babies’ feet, which comes from the ripstop mesh. Not to mention an added bonus for parents, these shoes have a hook-and-loop closure feature (Bungee laces) to help get those little feet in and out of the shoes faster. The Assert model shoe also has the quick Bungee on and off laces, to make getting your toddler ready even easier. 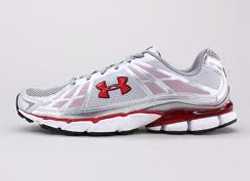 These are the same great Assert shoe that your older boys are wearing, in the mini model. Stability is enhanced in these shoes with a special synthetic design. Last but not least, the Nitric toddler shoe has the same great Bungee lacing technology as in all the toddler shoes, but has additional features such as breathability and superior support. Rest assured your little man will be running in comfort, quality, and style, while keeping you on your toes in any of these Under Armour toddler shoes. For your little princess, Under Armour spared no expense. Besides the cute design, these comfortable Under Armour Toddler shoes for girls are superior quality and keep your little one on the move. Engineered to help you get them on and off quickly, these shoes have the standard Bungee lace up system. To help protect those baby feet, the rubber cupsole gives her solid traction and provide long lasting durability, yet provide extra cushioning for more comfort. Allowing for your little girls’ foot to breath and flex easier, Under Armour put in a superior ripstop mesh which also helps the shoes stay snug and fit better. These toddler shoes are made with just as much quality as the shoes for parents chasing after the little ones.